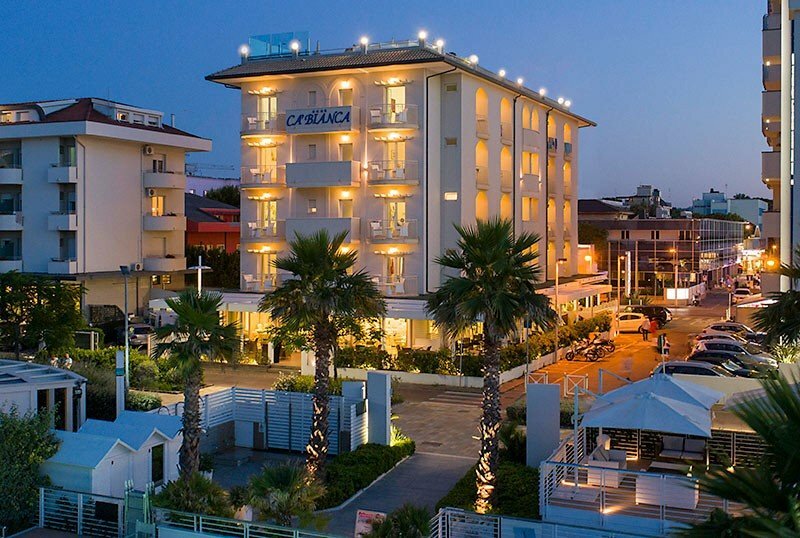 The Hotel Cà Bianca is a 3-star superior hotel in Riccione located on the seafront and facing the beach. Ideal for a family holiday thanks to the numerous services dedicated to children, has a panoramic terrace with solarium, swimming pool in the garden and Spa located in the attic. The structure is part of the Riccione Bike Hotel circuit. No pets allowed. The hotel is located in front of the sea and a few steps from Viale Ceccarini and Via Dante, the main shopping streets of the city. Its central position allows customers to move easily on foot in the city center and in the pedestrian promenade, full of restaurants and bars overlooking the sea. The rooms, recently renovated, are all completely soundproofed and equipped with balcony equipped with tables and chairs, mini fridge, safe and direct dial telephone with alarm clock, satellite TV and digital terrestrial, free WI-FI, independent air conditioning / heating, ceramic floors and bathrooms with hairdryer and shower or bath. Cleaning takes place every day, including the change of towels and sheets. CLASSIC : cheap and comfortable rooms, balcony with hinterland view. Available in double and twin versions. SUPERIOR : have a rounded balcony with a side view of the sea. Available in single, double, double, triple and quadruple versions. DELUXE : the balcony has a sea view. Bathrobe and slippers enrich the courtesy set of the bathroom and the rooms are equipped with coffeemaker with kettle. Double, triple and quadruple rooms are available. JUNIOR SUITE : guests are welcomed by fresh fruit and a bottle of sparkling wine, the balcony has a sea view and the courtesy set includes a bathrobe and slippers. The bathroom has a bathtub with a box. In the room there are also flavored incense, coffee shop with kettle and beach towel. These types of rooms are double, triple and quadruple. Swimming pool, large outdoor terrace surrounded by a garden with elegant lounges and a playground area for children. There is also a solarium area equipped with parasols and sun loungers and a heated swimming pool with Jacuzzi for 4 people. On the fifth floor there is a panoramic terrace overlooking the sea and within the structure there are bars and reading room, conference room with capacity for up to 30 people. The hotel is equipped for cyclists with bike rental service, gym available and laundry service. There are entertainment evenings such as gala dinners on Friday evenings, Romagna evenings and aperitifs by the pool. PARKING : uncovered and available subject to availability. A garage located in front of the hotel is available to guests. Both are paid and not guarded. CONVENTIONS : beach, amusement parks, discos, organized excursions. BREAKFAST : international and served buffet style in the porch overlooking the sea, with homemade pies and cakes, hot day pastries, cakes and crepes, fresh fruit, fruit in syrup, frankfurters, hot omelettes, bacon and many other delights. LUNCH AND DINNER : 3 menus and choice of Romagna and international cuisine with meat and fish dishes, vegetable buffet with warm side dishes and hors d'oeuvres. Water in all treatments. OTHER: weekly Romagna dinner, by candlelight. On Fridays, a gala dinner consisting entirely of fish dishes is served. In the hotel : strollers, bicycle seats, 1.2 m high children's pool and 50 cm deep hydromassage tub, baby / mini club (from 13.30 to 15 from 20 to 21.30), indoor playground area. Baby sitter and pediatrician available for a fee. In the room : bottle warmers, strollers, cribs, anti-fall rails, child seats, baby baths, night light, bed changing table. At meals : high chairs at the table, baby menu, baby food and homogenized (with the payment of a supplement). On the ground floor is the baby corner with bottle warmer and kettle available for parents. Afternoon snack and donut party on Fridays. The swimming pool is located on the ground floor, in a garden with a solarium area and connects to the hot tub through a small waterfall. During the day children can have fun in the petal-shaped pool with 1.20 m high water in the 50 cm deep hydromassage. The hotel has a modern spa with a massage area located in the attic. You can choose between different types of massage: relaxing, decontracting (whole, for the back), lymphatic drainage and sports. Also in the attic there is the Jacuzzi (in a splendid elevated position) of 4 places with water heated to 30 ° and again: chromotherapy, hydrotherapy, aromatherapy with rose essence. All treatments are made by specialized personnel. The hotel has an agreement with the "Bagno Giorgio" bathing establishments no. 110 and "Bagno Paola" n. 106, equipped with entertainment service, heated pool, hydromassage, hot showers inside the hair dryer, bocce courts, beach volleyball and beach tennis.